White oak shell medallion mantelpiece. Most wood fireplace mantels are cut with CNC, using digital codes to produce the pieces quickly, and then hand-finished. While this method of mass production may be practical and efficient, the results are mantelpieces that lack distinction and artistry. Not so with master wood carver Dimitrios Klitsas, whose hand carved wood fireplace mantels are custom carved from start to finish, after consulting with the patron to discuss their vision for the piece and its surroundings. As the “hearth of the home”, an updated mantelpiece has the potential to transform the character of a room, as well as add to the value of your home. 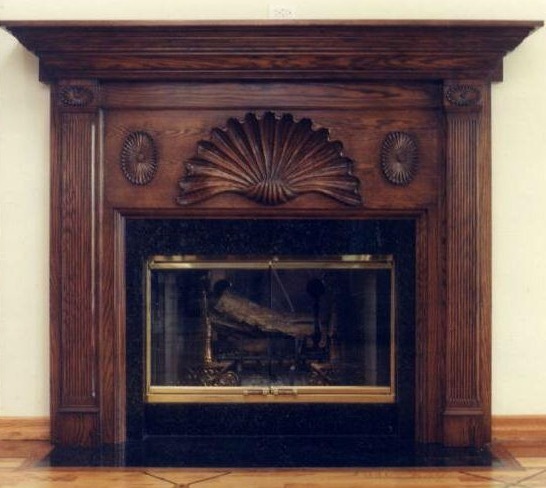 This entry was posted in Fine Art and tagged Fireplaces, Massachusetts, Wood Carving. Bookmark the permalink.